These guys are just fantastic. Quality service for sure. And I feel they are honest and MORE THAN fair. I have already returned to them and whenever I need anything done- they are the first place that I will turn. (haha- Paul will vouch for that).Why would you ever go to a place like Jiffy lube, or some greasy shop when you can go there and get first class exceptional and dependable service? I highly recommend Living the Dream. I refer friends and family to this business. I liked the idea of booking my next oil and filter change in advance. I am so grateful the LTDAC is so accomodating. The location is not very convenient for me but they are always able to fit me in when it is good for my schedule. I love living the dream everytime I go they are always nice and my car is always well taken care of best I have ever seen. 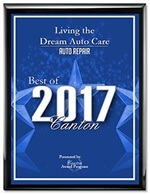 the service i have received at living the dream auto care has been very professional, personable and informative. whenever, i leave there, i know that my car has received a thorough going over and i know what needs to be done in the future and how much it will cost. paul and his staff are first rate. i would recommend them highly. My car battery died and everyone was very quick in helping me out! Thanks! I am very pleased with the service I have received on several occasions from Living the Dream. The guys are super nice and I feel as though their pricing is very fair. Very thorough. When my father gave this place a compliment , the rest of the family started to go to get our cars serviced. We are all satisfied and highly recommend.